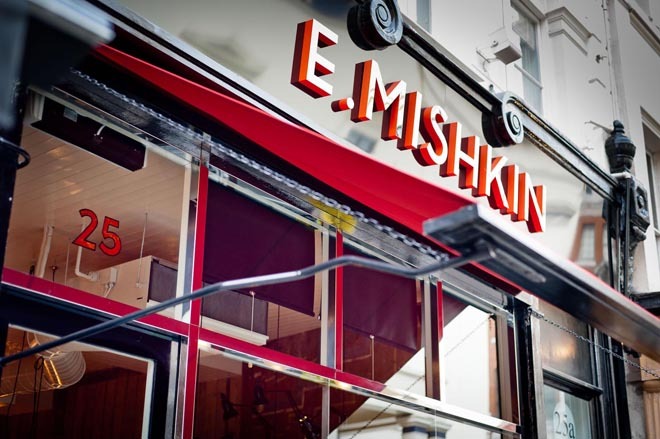 My love of Mishkin’s is well documented and I definitely think I’m going to make it my HQ during fashion week. Greasy, deli-inspired comfort food probably isn’t the kind of thing you should be consuming when you’re going to be surrounded by beautiful people – especially when, like me, you are prone to spilling your food all over yourself – but the heart wants what the heart wants. And think of all that walking you’ll be doing, eh? Alternatively, just stick to the booze – how many calories can there really be in a gin fizz? Don’t answer that question. Furcoat set menu: Cod cheek popcorn, macaroni cheese to share and a gallon of gin fizz. Definitely not your standard fashion week fare, Simpson’s is a throwback to a bygone era where pudding, cheese boards and lashings of port were all vital components of a meal. It may not surprise you to note that it was a 1930s favourite (what?) and its wood-panelled walls have been well documented in works by Wodehouse (what? ), E. M. Forster and Arthur Conan Doyle. Here’s an homage to Simpson’s from Something New, by Sir Wodehouse. There are all sorts of restaurants in London, from the restaurant which makes you fancy you are in Paris to the restaurant which makes you wish you were. There are palaces in Piccadilly, quaint lethal chambers in Soho, and strange food factories in Oxford Street and Tottenham Court Road. There are restaurants which specialize in ptomaine and restaurants which specialize in sinister vegetable messes. But there is only one Simpson’s. 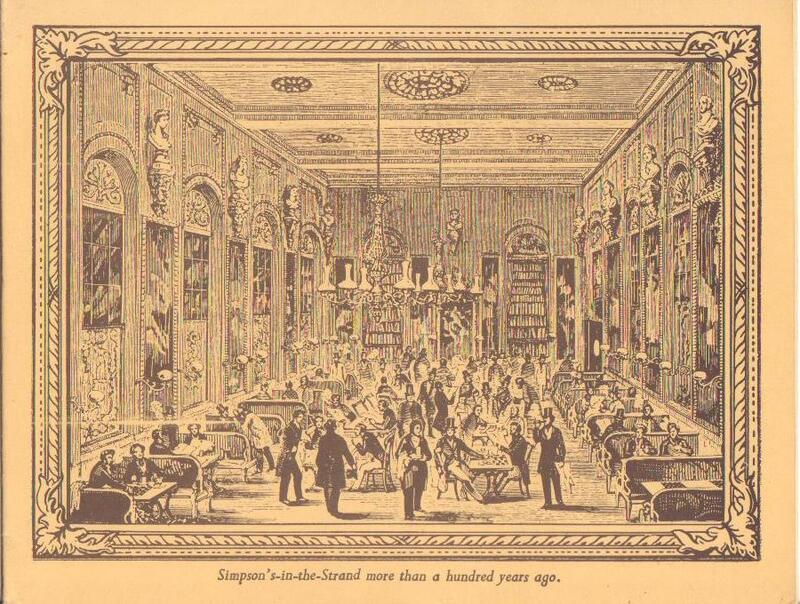 Simpson’s, in the Strand, is unique. Here, if he wishes, the Briton may for the small sum of half a dollar stupefy himself with food. The god of fatted plenty has the place under his protection. Its keynote is solid comfort. It is a pleasant, soothing, hearty place—a restful temple of food. No strident orchestra forces the diner to bolt beef in ragtime. No long central aisle distracts his attention with its stream of new arrivals. There he sits, alone with his food, while white-robed priests, wheeling their smoking trucks, move to and fro, ever ready with fresh supplies. Furcoat set menu: The Ten Deadly Sins breakfast (Cumberland sausage, streaky and back bacon, Stornoway black pudding, fried mushrooms, baked tomato, egg, liver, fried bread, bubble & squeak and baked beans) washed down with a glass of Theophile. Just kidding, I’ve never had that breakfast – I’d stick with the Wodehouse, country house breakfast theme and take the kedgeree and grapefruit juice. That or ribs and a Martini in the art deco splendour of Knight’s Bar. 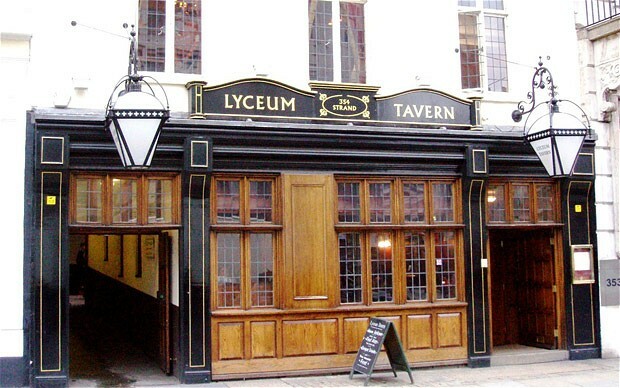 Probably the least fashion week place possible, the Lyceum Tavern has the advantage of being a) right opposite Somerset House and b) completely devoid of fashion people. It’s a Sam Smith’s pub so it’s about £2 a pint, inhabited by old men and if you’re looking for a quiet place to sit and type up some notes or, well, just have a few drinks, there’s nowhere better. I can guarantee you will not bump into anyone who might intimidate you. Upstairs is like upstairs at any Sam Smith’s pub – less character but really nice and quiet. Furcoat set menu: A pint of Taddy and a bag of salted nuts. 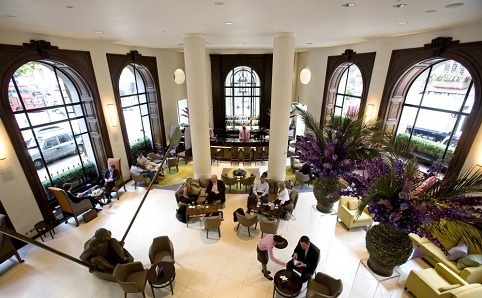 If you want a drink in spitting distance of Somerset House, the Lobby Bar at One Aldwych is a much more sophisticated option than The Lyceum Tavern. 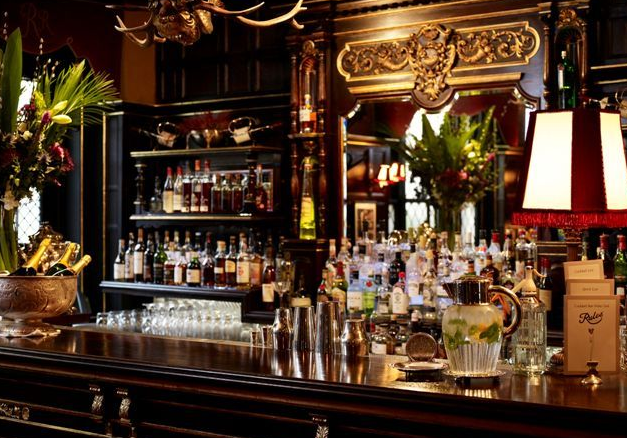 Excellent cocktails – with a heavy emphasis on whisky – this place has been voted one of the best hotel bars in the world by the Sunday Telegraph and the Standard called it the most beautiful lobby bar in London. Fancypants! Furcoat set menu: A Purple Jack – blackberries and peach purée shaken with Gentleman Jack Rare Tennessee whiskey and aromatic bitters. I can’t believe I’m telling you about The Coal Hole. This has been my secret for many years, but I guess it’s time to spill. 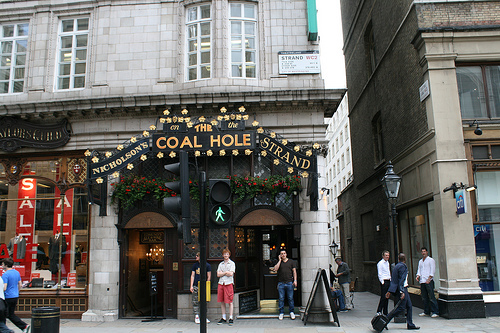 The Coal Hole looks like a bog-standard crappy tourist pub from the outside, but don’t let that fool you. 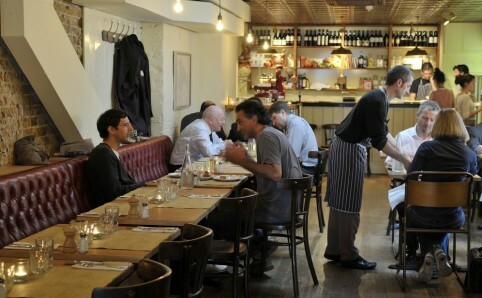 The interior is pretty nice as far as London pubs go – all wood and low ceilings and the like. They have a smashing selection of ales and it’s pretty reasonably priced too. There’s an upstairs bit where you can scurry away and hide, if you need to escape fashion week funtimes. FACT! Gilbert and Sullivan used to perform here and, apparently, the name stems from the fact it used to be the coal cellar for the Savoy. Furcoat set menu: Whatever ale they’ve got on will do, ta. It feels wrong to include two places from Russell Norman and Richard Beatty but seeing as they basically rule London’s food scene, it’s a bit unavoidable. And, Da Polpo is brilliant. I think the staff are probably the nicest people in the world and it’s beautiful inside two. Food is Italian/American comfort food and the old small plates mean you feel like you can order a million things and it’s totally acceptable. Furcoat set menu: Mortadella and gorgonzola pizzette, pork and fennel meatballs, chicory and pear salad and an old fashioned to wash it down. Then a cheeseboard. Rules is allegedly London’s oldest restaurant and the trad English menu definitely reflects that – game, and lots of it, pies, roasts, puddings… All the good stuff. It’s a bit like Simpson’s in that you could happily bust your arteries there on something heavy and homely and delicious, but I’m all about the cocktail bar. You’ve always been able to have cocktails with your food, but now there’s a whole separate lounge which is as gloriously decadent as the restaurant itself and is the closest I’ll ever get to drinking in a gentleman’s club. There’s a secret entrance with a doorman and everything. Oh, and the oysters are only £2 between 12 and 4:30. BODACIOUS! Furcoat set menu: The Rules cocktail – Champagne, gin and pear liqueur. 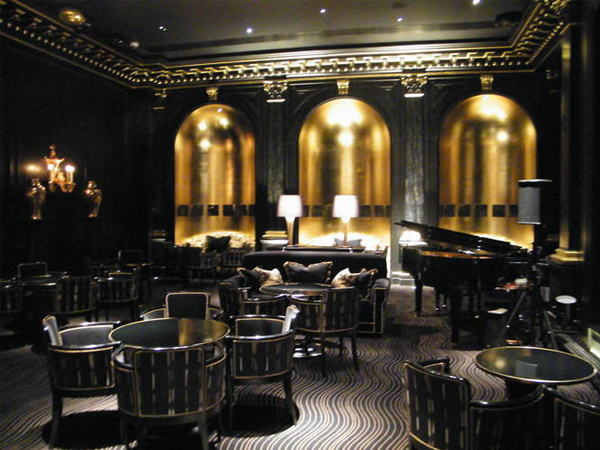 For full-on art deco splendour, it has to be The Savoy, really. There are a couple of bars and restaurants to choose from, but the Beaufort is the most beautiful and the best example of the painstakingly recreated 1920s glory that cost them £220 million. It’s kind of intimidatingly beautiful and the fact that it inhabits the space previously taken by the cabaret stage makes it even more exciting. You can watch a video about the bar here to see a bit what it’s about – the gold walls! The drinks in birdcages! The kinda mad singing woman with a bob! Next Post Thank Furcoat it’s Fashion Week: Watch all the London Fashion Week shows live here! Amazing round up! I want to go to the Beaufort Bar hard. I’ve still not been! This is just a dream… why don’t we go for my birthday? I’m not going to any shows, just hovering round all these places to stalk you.